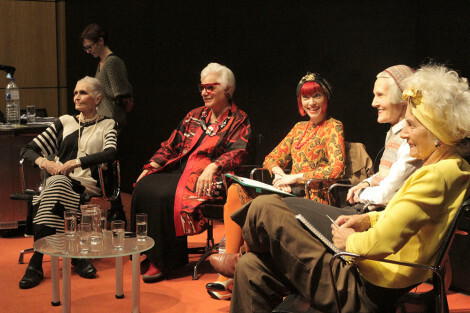 On Wednesday last week I was lucky enough to go along to a fabulous conference held at London college of fashion, “Mirror mirror: representations and reflections on age and ageing”. The conference included many marvellous speakers on a variety of topics concerning age. Papers on Petula Clark and Joan Rivers were particularly and perhaps surprisingly fascinating. The event ended with a wonderful panel chaired by Amber Butchart with some of the “stars” of channel 4 documentary “Fabulous fashionistas”. This panel was thought provoking, and actually quite emotional. The four women: Jean, Sue, Bridget and Daphne were utterly inspiring. There sense of style, and vitality of life created a lot of questions regarding how we can/ should view women of a certain age. This blog post though focuses in on a paper presented by Professor. Julia Twigg “Moving younger: dress, age and fashion”. This is a mixture of notes taken from the paper presented and my own thoughts relating to what Julia had to say. Within the past few years there has been an increased visibility of the stylish older woman in fashion, particular mention here must go to Iris Apfel (who I wrote about here) and the “Advanced Style” blog by Ari Seth Cohen, but what does fashion for the older woman mean? What is the traditional narrative of ageing? Dress is, traditionally age ordered. There is a creation of a systematic pattern of ageing which has an almost cyclical nature (here Julia showed an interesting diagram featuring both a baby and an elderly man essentially in very similar clothes. Demonstrating the comfort and ease factor required at both the beginning and the end of ones life). As we get older in particular it is not what is “appropriate” for an age group, but increasingly what is “inappropriate”- lexicon involved in dress as we age immediately taking on negative, rather than positive connotations. The necessity/ desire for change in dress directly follows with the changes that the body goes through as it ages. This can be seen as an interplay between the physical ageing of the body and cultural ageing, and the fact that dress as a material object has a physical interaction with the body. The de-sexualisation of the aged body is a particularly pertinent one, with so called “classic” styles representing a rejection of frills and flounces for something plainer, and a more covered up look that sees a rejection of femininity. Can I still get away with it? Do I need something more appropriate for my age? With an increasing ageing population it is a necessity for the fashion industry to respond to a growing group of consumers, and offer them positives on dress rather than negatives. The social and cultural demographic of the older generation is now changing. Old age comes later. Middle age extended, with old age only truly appearing with the onset of serious illness. Retailers today must take note that no longer is the sole manner of dressing for an older population a “classic” look. Increasingly older people are shopping more, particularly in the 75 plus age group. There is a persistent language of “moving younger”. 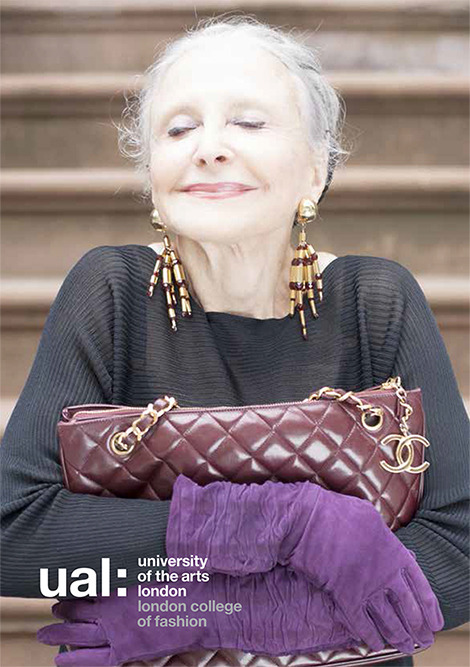 Consumption is aspirational, and it is more a case of women dressing how old they feel rather than how old they are. Clothes that fit a changing shape but are still stylish are essential. What is the fashion industry doing? Here is where I put my former fashion design student hat on. I remember attempts by a number of students on course to cater to the older woman in their design projects, with less than successful results. The problem being, in some respects, the inability of the young 20 something fashion student, without intensive customer profiling being able to truly understand the design needs and wants of an older customer demographic. As Julia demonstrated clearly in her presentation for an older demographic components such as fastenings need to be more carefully thought of as well as shaping of things such as armholes and necklines to ensure an ease of fit. But these necessities do not mean that clothes have to be less stylish, they just need to be thought about in a slightly different way. Colour, is a huge aspect. As the four women who Amber interviewed later on clearly demonstrated. Comfortable pieces in bright colours are a necessity particularly with respect of being able to either keep warm or cool you down (a theme that ran through another presentation by professor Jane McCann). The lack of appropriate fit models (mannequins) for producing garments for an older demographic is also problematic, as the body changes no longer is the high bosom and 10 inch waist to hip ratio suitable and therefore the silhouette has to be altered. It was positive to see that the size 18 fit model that Julia showed seemed to truly represent the figure of an average older woman. I also remember the somewhat mixed results of a styling project completed in the final year of my undergraduate degree in association with Marks and Spencers (I’m not going to lie, I hid this from the world, because my groups did not turn out as intended at all), but another of the groups who completed the project had their work featured on the Daily Mail online. The styling of the older woman here received deriding (and unfair) comments. Describing the model as “mutton” and questioning what the womans family would think of her being dressed in such a way. (Read the original article here: http://www.dailymail.co.uk/femail/article-2088441/M-S-model-takes-turn-catwalk-tender-age-86–decades-assignment.html). What is the older population? A new culture is now arising though of “successful ageing”, and the paradoxical requirement of getting older without appearing to do so. There are aspirational figures that represent this “successful ageing” such as Helen Mirren and Judi Dench. Do women want to look younger than they are? Or, is “good for their age” a stronger concern? Julia then bought up the subject of Mrs Exeter. Someone I wrote about (what now feels like many moons ago) here. I highly recommend having a read of this previous piece I wrote as it gives you a good insight into the changing perception of women between 1949 and the early 1960s. Today it is becoming increasingly difficult to define the older generation and what they want to be, versus what the public wants them to be. A point that was particularly prevalent in the fabulous fashionistas documentary. Of course, this can be quite paradoxical though. Not every woman wants to try and dress younger than she is. Is there too much societal pressure to stay looking young (or even good for your age), being fit, and stylish? Has it now become unacceptable to choose to dress in a way that one would traditionally associate with the “Grandma” image? Style, as the final session of the day showed is very much a personal thing, and anyone of any age can have “style”. Fashion firms today must be aware that women of any age want to dress well, and hopefully that dress for older women should not be viewed negatively, but instead positively. Rather than dressing through worry of conformity you should be able dressing how you want to dress , and the clothes being accessible for you to be able to do so.